Lhasa Xining Train Travel- Even though there are many trains for Lhasa from Beijing, Shanghai, Guangzhou, Chongqing, Chengdu, the most frequent train for Lhasa is from Xining. There are about 5 trains head to Lhasa every day. Therefore, travelers from home and abroad can easily catch the train to Lhasa. However, the direct Xining-Lhasa train is not daily but every other day. 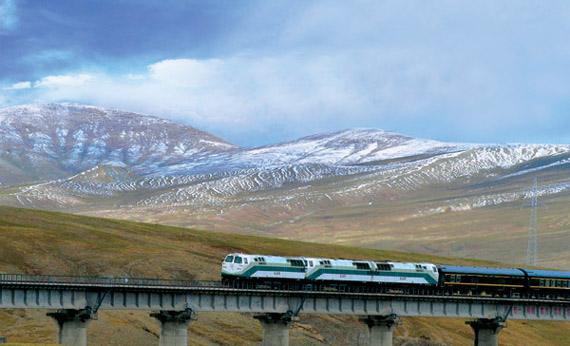 Qinghai-Tibet Railway, Lhasa Xining Train Travel Qinghai-Tibet Railway Z6801(Direct) Distance Arrival Time Departure Time Duration Xining West 0 km ~ 14:05 ~ Delingha 521 km 18:07 18:13 6 mins Golmud 830 km 20:57 21:22 25 mins Amdo 1524 km 5:34 5:38 4 mins Nagqu 1650 km 6:57 7:03 6 mins Damxung 1808 km 8:39 8:43 4 mins Lhasa 1972 km 12:00 ~ ~ The other trains passing through Xining are Z223 Chongqing North-Lhasa, Z21 Beijing West-Lhasa, Z265 Guangzhou-Lhasa and Z165 Shanghai-Lhasa. For more Tibet travel info, please follow our Tibet Travel Blog. We'll update the latest news and tips every working day.